Confectionerynews.com brings you the ten best selling confectionery brands in 2012 based upon figures from Euromonitor International. Mars' Wrigley gum takes the top spot with a 4.7% share in retail value sales. Kraft Foods' Cadbury is the premier chocolate brand and is some distance ahead of its nearest rival, Mars' Snickers. 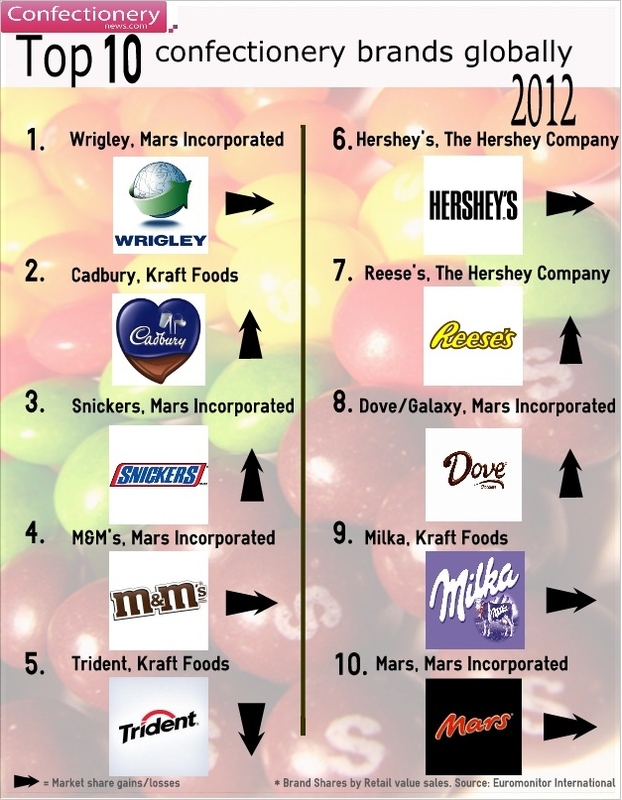 Just three firm's make the list: Kraft Foods, Mars Incorporated and Hershey. One notable absentee is Nestlé, the third largest confectioner, according to Euromonitor. Nestlé's Kit Kat was just outside the top ten, although it holds the same retail value sales percentage as the tenth placed Mars brand. Mars leads the pack with five entries in the top 10, followed by three from Kraft and two from Hershey. Cadbury, Snicker's, Reese's and Dove were able to gain market share on last year. Trident is the only brand in the top 10 to have lost market share, but it was still able to retain fifth place.